With God everything is possible. Dejeselam, God bless your service.We are geting very important information about our church from you. Now, we all are responsible. We need to address the problem from the source not the symptom. We shouldn't think that Begasha is the only problem. He is now lost and he will not recover again. Because, our people has tolerance limit and he abuse the people over that limit. Morover,he has not confessed his mistake. He still want confuse the people and even he undermind the thoughtfulness of the people.The people knows what they are doing.Let us think to the cause of the problem. I personaly participated the conference organized by Mahibere Kidusan. Just go and see it on Hamle 10, 2003 E.C at Kokeb Adarash. Paulos and his crew has to go!!!!!!!!!!!!! Ye Ethiopia hizibe hoye le Egiziabehere tseleyu ebakachihun. Egiziabehere hoye betchrstianachinene tebikilene, le sewochim lebona sitachew. Ebakachihun hulachinem be nitsuh lebona entseley. I mean for whatever crime he commit. He is more than criminal. We lost not only lives but also our church's dignity!! Let the people force him out and take very serious action on him!! What are we afraid of? I know what people think (meles?? ).I clearly understan meles is with this criminal. But what we have is far far more powerful than what paulos has behind him. God is with us and for sure we are the winners!! Oh God! please save your people and TEWAHDO!! I DON'T GET WHAT ETHIOPIANS THINK,WE READ IN DIFFERENT ETHIOPIAN ORTODOX TEWAHIDO CHURCH AND ETHIOPIAN HISTORY BOOKS KIDUSANS,SEMATANS,HAWARIATS AND CHRISTIANS FIGHT AND DIED FOR THIER RELIGION .EVEN NOW IN EGYPT CHISTIANS FIGHT AND DIED.WHEN WE COME TO ETHIOPIAN ORTODOX CHURCH OUR FATHERS AND MOTHERS ALSO FIGHT AND DIED FOR THIER RELIGION /e.g during emperor sisinios the father of atse fasil more than 25.000 people died,and the king loss his power./ BUT THIS GENERATION INCLUDING ME, ARE VERY SELFISH.WE DON'T WENT TO FIGHT AND DIED INSTEAD WE COVER OUR SELFISHNESS AND SCARE BY SAYING GOD WILL GIVE US SOLUTION OR PRAY TO GOD.I KNOW GOD CAN DO. BUT ARE WE READY TO PRAY? ARE WE READY TO KNOW AND READ WHAT GOD SHOWS AND TELL US? EXCEPT SOME,THE ANSWER WILL BE NO.EVEN SOMETIMES ABOUT ABA G/MEDIHIN;GOD MAY ALLOW HIM TO DO ALL THIS THING IF NOT, GOD CAN REMOVE THIS GUY.A LOT OF PEOPLE SAYS. NO!BY THIS KIND OF WAYS,TRUST ME WE WILL NOT GET ANY SOLUTION IN STEAD WE LOSS OUR CHURCH TURN BY TURN. 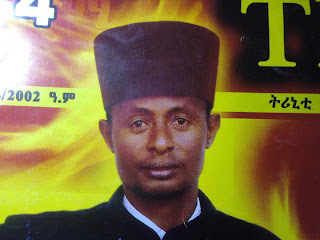 AS I SAW RESENT CASES IN CHURCH e.g CASE OF GETACHEW DONI AFTER HE REMOVE FROM HIS POSITION IN AWASSA,THE HEAD OF THE CHURCH APPOINT HIM IN THE OFFICE /WHEN I SAID THE HEAD OF THE CHURCH IT IS NOT MEAN SINODOS RATHER ABA G/MEDIHIN/.FROM THIS WHAT YOU UNDERSTAND BEGASHAW AND HIS GROUP ALSO THEY HAVE BIG CHANCE TO GET THE POSITION WHAT THEY WANT. BELIVE ME. "getawan yetemamenech beg latun wichi tasadiralech" ABA G/MEDIHIN IS THE ONLY PROBLEM FOR OUR CHURCH.DON'T GO ANY WHERE TO FIND THE PROBLEM. PLEASE CHRISTIAN OPEN YOUR EYES OR DON'T SCARE TO FIGHT THE CHALLANGE OF THE CHURCH.IF WE REMOVE THIS PERSON FROM OUR CHURCH, OTHER GROUP WHO DISTURB OUR CHURCH WILL NOT GET CAVE TO HIDE.THAT IS THE MAIN SOLUTION. I WILL TELL YOU ONE THING DON'T FORGET ETHIOPIA IS THE COUNTRY OF GOD NO ONE CANN'T TOUCH. kamachewum gize balay ya Igziabher tsega yibzalachu. yamitisatun maraja hulu kabaki balay naw bihonim gin lamalaw ethiopia madras yamichil radio wayim biyans gazeta kaljamarachu bastakar ahunim ka 80% balaay yalawun hizb madras atchilum, ina ibakachu biyans gazetoch yanantan maraja yizagbu zand fikad situwachaw. salama Igziabher kananta gar yihun. ብቻ አሁንም ጥንቃቄ ያስፈልጋል !